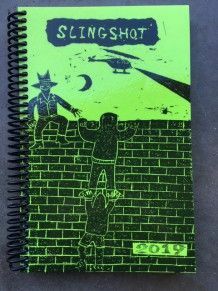 Now in its 25th year of publication, the Slingshot Organizer is a must-have for punks, radicals, and free thinkers! The large-size version is bound with a super tough tough plasticoil binding (a new feature for 2016) and is twice the size of the �classic� pocket organizer (5.5 inches X 8.5 inches) with twice as much space to write all the events in your life. It is 176 pages. It includes radical dates for every day of the year, space to write your phone numbers, a contact list of radical groups around the globe, menstrual calendar, info on police repression, extra note pages, plus much more. The covers are laminated with heavy duty 3 mil glossy plastic to help it survive the year. Cover and ink colors vary and we don't know all the color names that Slingshot is using, so if you have a request please name your color(s) in plain English (ie blue, red, purple, etc) and we�ll do our best (no guarantees though! ).